Our products are built by leading manufacturers and we pride ourselves on delivering an equally high level of service. Contact us today for expert guidance or use our design tool to generate a quote for your home improvement project. Create more light and space in your home with our range of beautiful conservatories, orangeries and replacement roofs. From secondary glazing to glass splashbacks, ballustrades and cut glass, we offer tailored services designed to suit you. Come and visit us at our showroom to see our range of products up close. Have sneak peek with our virtual reality tour! Hertford Glass offers a complete range of double glazing and related services. Perhaps you need to replace your doors and windows or want to extend your home by adding an orangery or conservatory. Alternatively, you may live in a listed building or property where double glazing isn’t an option – in which case you’ll be looking into the benefits of secondary glazing. We cover a wide geographical area and our products have been carefully sourced from leading manufacturers to ensure quality. The Hertford Glass team will help you with all aspects of the design, so that your product is tailored to suit your specifications and adds market-appeal. Looking for a no oblgiation quote? Use our design tool to choose your ideal home improvements quickly and easily - and as many times as you like. When you choose your double glazing – or any other product or service – from Hertford Glass, you can buy with confidence. We only work with industry leaders that meet our high standards, so your installation will be built to last. Full manufacturer warranties come with each of our products for your additional peace of mind. Additionally, our insurance-backed guarantee is administered by the specialist insurance broker GGFi. The quality of our double glazing products and service are independently assessed by various competent person schemes and recognised industry bodies on an ongoing basis. We are members of FENSA, the Glass and Glazing Federation (GGF) and the BFRC. We have also been approved by the Which? Trusted Trader scheme. We want to provide our customers with double glazing solutions that are tailored to their requirements, and which provide long-term value. Our experience and range of products enable us to locate creative solutions to almost any home improvement project – no matter how challenging it might be. Read the testimonials below to find out about the projects we’ve competed and to find out why each customer was delighted with the outcome. If you feel inspired after reading about some of our double glazing solutions, please call our team directly on or send us a message. What a wonderful, professional set of fitters you sent up. Vince (I think) and his mate were excellent, great work and very tidy. I will certainly recommend you to anyone who asks! Thanks again. Your company recently completed the installation of a further three windows in our property. With regard to Mr Terry Hurt, we would like once again to commend his work as exemplary. What a blessing it is to have a workman with such integrity who works so hard and completes his assignments 100%. We are completely satisfied with our replacement windows and commend your product. Thank you. It has been a real pleasure to do business with you. Can you please pass on this message to whoever is in charge at Hertford Glass. I have just had my windows and front door replaced and I would like to say how pleased my wife and I are with the service we have received from Hertford Glass. Ian and Luke worked extremely hard and completed the work to a very high standard. They started promptly yesterday morning, worked quickly and efficiently, and have left everywhere spick and span. They are both a credit to your company and I will have no hesitation in recommending your service to anyone else. Please also pass on our thanks to Ian and Luke, from two very satisfied customers. Just a few lines to say a very big thank you for your fast and efficient service on Friday 17th January 2014. At such short notice you were willing to send one of your team to replace the panel removed by our burglars. Then on the following Monday to make secure and re silicone all the units on the front of my property. Once again thank you for all your efforts it is much appreciated. 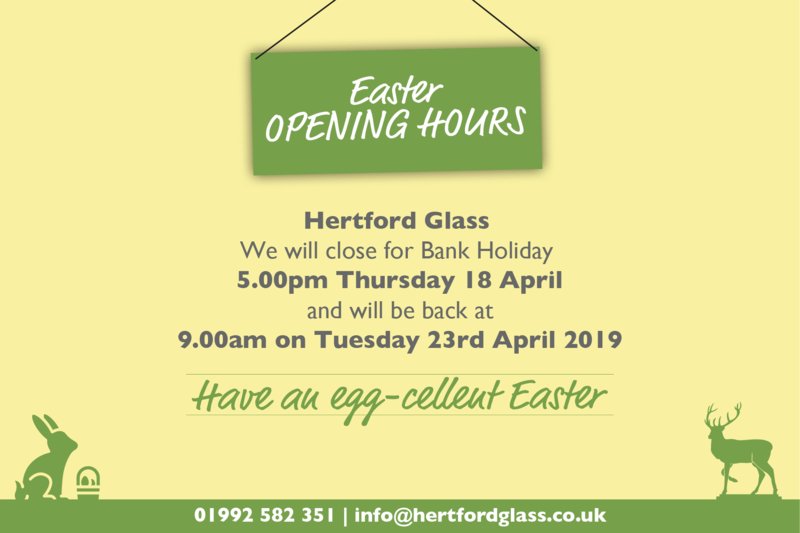 We are absolutely delighted with all of the work you have carried out for us, and we were extremely impressed by the skill and professionalism shown by everyone at Hertford Glass. We are very glad we chose your firm for this work. Please find enclosed a cheque for the balance of payment for the French doors which were recently installed. Thanks for doing such a good job, we are very pleased with them. We would like to take this opportunity to say how pleased we are with the service we received recently. We found the tradesmen to be efficient and friendly, and liked that they left our home clean and tidy. All three come highly recommended. Just writing to say a very big thank you for your excellent “after care” service. We have just had new hinges on our back door in relation to draughts and there has been no charge and a very friendly and efficient service throughout. As you know I have used your company since living in this area and will obviously continue to do so. It is so nice and comforting that some firms really care. Wishing you continued success in the future, especially in your new premises. A short note to say how satisfied with the installation team who installed our patio window. I don’t know the installers name but he was efficient and a good worker and we think he made an excellent job of the work he did. Please pass on our thanks for a job well done. Choosing aluminium doors that will make your home more effective at retaining heat is important. The double glazing we install will include a polyamide thermal break designed to stop cold air entering your home and heat from escaping. Lower heating costs will most likely follow the installation of your aluminium doors, and the size of your carbon footprint will shrink. Practically and economically, our doors make sense. Contact us for further details and guideline prices. Inviting more light into your home will make it feel spacious. Aluminium is incredibly strong, so less of it is needed during the manufacturing process. This results in designs that use less frame and more glass. Panoramic views of your garden will be created once we’ve installed your aluminium windows. At all times of the year, you’ll be able to enjoy a room space the feels ever-connected to the world beyond your glazing. Your aluminium doors will be built to last. Strong and weatherproof, they won’t fail when exposed to harsh weather conditions like wind and rain. Instead of rotting or warping, your installation will continue to deliver long-term value. The inbuilt strength of an aluminium door means it has a second advantage. Intruders attempting to gain access to your home will struggle – even when using great force. This means your installation will protect you from most break-ins. The appearance of your aluminium doors matters. Your aim is to match performance with stunning sightlines so that your installation is perfectly balanced. When you choose Hertford Glass, you’ll be able to able to build a product that ticks all your boxes. Choose from our exquisite range of colours and foils; then complete your installation by selecting your preferred hardware, accessories and glazing. Start creating your dream door now by contacting our team today for a free aluminium doors quote. Hertford, Welwyn Garden City, Ware, Hoddesdon, St Albans, Bishop’s Stortford, Epping, Kimpton, Ongar, Pirton, Chorleywood, Cottered, Cheshunt, Brentwood, Billericay, Romford, Baldock, Berkhampstead, Bovingdon, Buntingford, Codicote, Nasty, Redbourn, Rickmansworth, Upminster, Royston, Shenfield, Tring, Sawbridgeworth, Hatfield, Hornchurch, Knebworth, Stevenage, Letchworth, Ashwell, Barnet, Borehamwood, Harpenden, Hemel Hempstead, Hitchin, London Colney, Potters Bar, Shenley, Watford and the surrounding area.